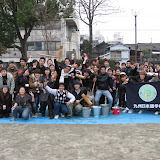 We have a MOCHITSUKI party on the last school day,25th Dec.
We used a traditional tool "KINE" and "USU" to make Mochi. It's very soft and good. We wish your Happy new year! !